【Easy to Set Up】: Comes with everything you need for quick and easy tree hanging. Ropes, Metal Carabiner and set up Instructions. Our Strap is Easy to hang on and take down. Just 1 Minute to start your Hammock Time. 【Lightweight Portable Packing】: All the accessories can be perfectly fit into the attached small sack in a minute. The attached carrying pouch is easy to take along when backpacking and makes assembly and disassembly a snap. 【Daily Care】: Our Hammocks are made from parachute Nylon fabric which is strong, breathable, durable, fast-drying ad comfortable. Easy to be cleaned and dry quickly after being wet. 【Best Gifts Ever】: The Best gift for light traveling, camping, backpacking hiking and sleeping. It can be easily and quickly hung on in jungle, beach, bedroom, backyard, indoors or outdoors. 【Money Back Guarantee】: If you’re not 100％ happy with our hammock, we provide a full refund for you as long as you send the hammock back. Portable Camping Hammock, Family-style comfort. Make your family time more relax! The Apriller Hammock is as comfortable as it is roomy. Its size lets the whole family join in for wonderful hammock time. 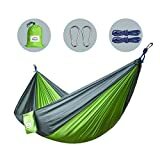 Versatile Functions: Ideal for hiking, camping, boating, traveling, back-yarding, beach & lake, or just relaxing, perfect alternative to a tent, sleeping pad, ground mat, swing, cradle, and yoga mat. Supplied with a portable built-in carry pouch making it extremely portable and light. If you don’t satisfied with this hammock, we’ll provide you with a 100％ Money Back Guarantee.